Unfortunately, any "message" McCain may have been sending to Putin and the idiot Trump will be ignored by both of them. It's also unfortunate that since the dumb one has been in office, Russia has become America's close "friend." It will be great when the day comes and everyone can finally discover what Putin has been holding over the moron Trump's head to get him to fear Mother Russia. Standing with one's "friends and allies" is best done after thoroughly checking their ground(s). Some quarrels are best left alone or else too many innocent people may get seared in the wrong stand of the firebrands. Poroshenko is suspected of heavy drinking. It seems Samantha Power’s mention of Poroshenko made you see red again. Russia’s haters of Ukraine have been suspecting him of drinking for over four years, since he became president. What a shame your Foreign Intelligence Service have failed to find any proof of that for more than four years! Ah - the deliberate use of the passive to smear. "He is suspected of . . ." - BY WHOM? It's as bad as "They say that he . . ." - Who is 'they'? WHO says? What EVIDENCE do they have? Rumours from undisclosed sources are a major tool of the propaganda machine. Drago, Good advice in general! Well, that black and white picture is from an undisclosed source itself. WHO says that? What EVIDENCE do they have? And so on. Apply your strict requirements to yourself first. The use of anonymous "wise sayings" in a picture is widely spread on the internet as a means of manipulation. It's clearly aimed at making the reader think the saying belongs to someone authoritative. That it's something indisputably right. Because it doesn't even need the name of the author. It's a general truth! Otherwise, why don't people just say it themselves? Because they are not sharing an idea or opinion, they are imposing them. Now, to my post. That Poroshenko is suspected is a fact. That he is a heavy drinker is a rumor. Did I try to pass it for a fact? No. I presented it correctly, as a rumor. He is suspected. Not even "he is said". Not "he is considered" or "he is known". Besides, my post was a joke and this thread itself is a joke because it's about a typo in a tweet. I don't think it's correct to treat it as if it were a serious discussion. This thread is a joke because it's about a typo in a tweet. This thread is an ordinary thread, not a joke. Someone noticed a typo in a politician’s tweet and suggested that the forum members discuss it. The typo itself might seem funny, like any typo seems funny to some elementary school children, but that makes no difference and the thread is a thread. I don't think it's correct to treat it as if it were a serious discussion. Y111 wrote: "Well, that black and white picture is from an undisclosed source itself. WHO says that? What EVIDENCE do they have? And so on. Apply your strict requirements to yourself first." You are right about the strict requirements, they should always apply to the preacher first. The fact of the matter is that it is a meme, not a fact, and it had not been properly attributed when addressed to you, in this forum. 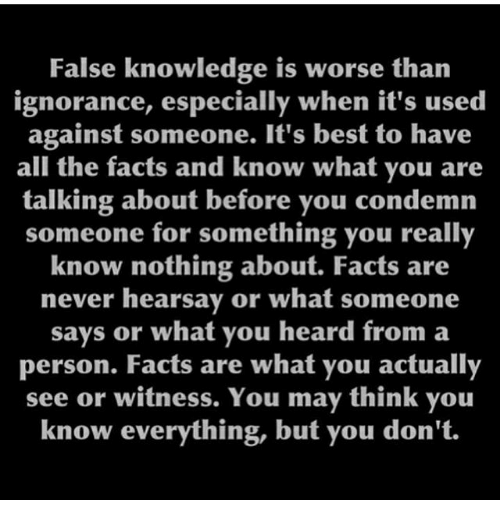 You see, "false knowledge" is worse, indeed. I think Shaw had a better take on it: more dangerous! Drag0nspeaker wrote: "Ah - the deliberate use of the passive to smear." Is that a fact according to your unattributed meme brandished at an unspecified member, here? Slow day or slow on the take? One week later, only to unfairly chastise and lecture; Oh! The deliberate neglect! Yes, the right thing should be done the right way. I agree that sharing suspicions is itself suspicious. So it can be questioned. However, if you don't like what someone has said, why not tell him that face to face? Why talk to the air and hide behind tablets with holy inscriptions? It looks like either arrogance or cowardice. Senator McCain raising from his box and searing your porcine president right beside the head of NATO - it is funny. And it is not I who made a comedy of a sad event - it's the powerful Samantha who needlessly dramatized it. And you know what? I do not read her tweets regularly. It's liberast media that brought this particular one to my attention to make me tremble. And I read it and laughed out loud. Senator McCain raising from his box and searing your porcine president right beside the head of NATO - it is funny. You definitely have a most fertile imagination. I wonder if it is equally funny for you to visialize you mother or father raising from their boxes and doing things. Once again you remind me some school children who try to compensate for the lack of their self-esteem by teasing and trying to humiliate others. She is not nearly as powerful as Poroshenko. As you probably know, at his last parade two or three more soldiers fainted in his presence. Apparently they couldn't stand the emanation of his power. You are going to get a wryneck looking all the time in the direction of Ukraine. Why don’t you look around so you can see lots of similar cases all over the world and in Russia in particular?